Formerly a garage/office + several large storage tanks. 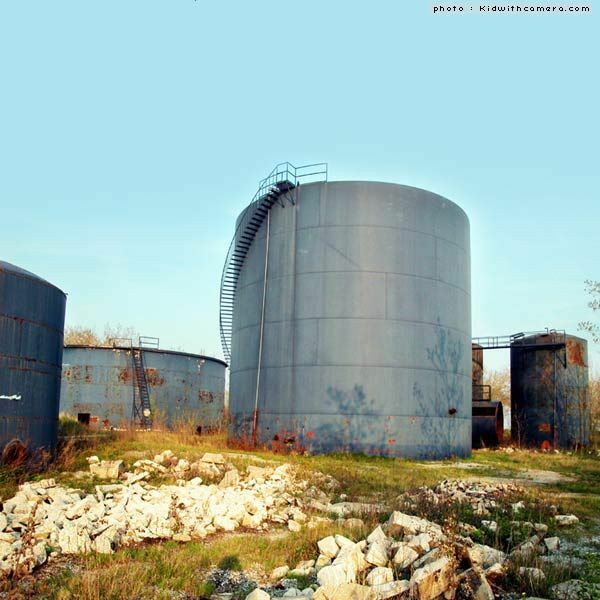 There are about eight mostly blue oil tanks of varying sizes. The one with the largest circumference has several large squares cut out along the ground level (some regular doorway size, one as big as a small garage door). You can look in and if it’s a sunny and it’s overhead (noon - 4pm usually), the sun shines through all the small holes in the lid of the tank and makes a really beautiful effect like stars on the darkest sky. The small buildings (kitchen, office, garage) are fairly boring and smashed to bits/covered in neon graffiti but the oil tanks haven’t really been damaged by vandals. This location's validation is current. It was last validated by Emperor Wang on 12/20/2016 12:28 PM. This page was generated for you in 78 milliseconds. Since June 23, 2002, a total of 574106558 pages have been generated.